The following external links provide further information relevant to herbarium specimens, digitization, and data access. 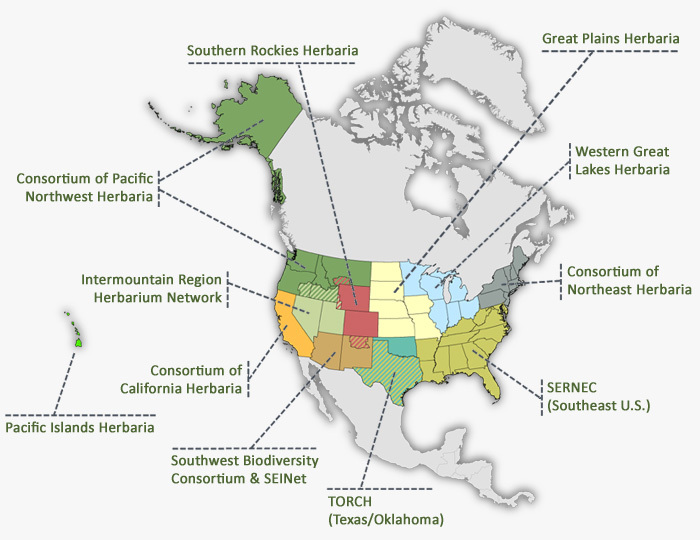 The Consortium of Pacific Northwest Herbaria is a regional network within the U.S. Virtual Herbarium (USVH). The goal of USVH is to promote digitization and online access to all herbarium collections within the United States. Also at the national level, iDigBio is working to integrate all U.S. natural history collections into a single online access point. Promotes the digitization of all specimens in all U.S. herbaria and communication among herbaria. An NSF-supported initiative to put into electronic format all records in U.S. collections of biological specimens. An international, government-initiated and funded initiative focused on making biodiversity data available to all. A comprehensive list of links and documents relevant to digitizing biological collections, particularly herbarium specimens. Maintained by the Consortium of Northeast Herbaria. Learn how CPNWH images herbarium specimens. Included are detailed descriptions of our equipment and workflows. Software scripts are available for download. TDWG focuses on the development of standards for the exchange of biological and biodiversity data.